Ruffino Beniga, or Mr. B, is currently working on his Master's at U.C. Davis. Ruffino Beniga or Mr. B for short is a new chemistry and physics teacher here at foothill high school. He’s from Fresno, Ca and went to Bullard High. After he left high school he went to a community college for two years, and then transferred over to U.C. Davis for 5 years to get his teaching credential. At first he didn’t know what he wanted to be, he changed from wanting to be an astronaut, to currently teaching as a teacher. He became interning as a teacher and fell in love with teaching. 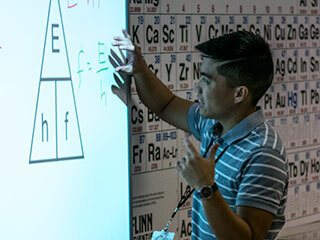 He just started as a student teacher for a year and now he has his with 1st full job as a science teacher.